Kang Chiao International School East China Campus (KCISEC) is located in Kunshan, Suzhou, and is well known for inspiring the values of “modesty” and “humanity”. In addition, KCISEC advocates “global awareness” by promoting arts and cultural activities. In March 2015, the KCISEC Orchestra was officially established and received enormous support from the administration, especially from Chairman Mike Lee and Superintendent Charlie Chang. The KCISEC Orchestra features more than one hundred students from Grades 3 to 12. Since its inception, the orchestra has gained a positive reputation thanks to the outstanding support of the Board of Directors, Superintendent Charlie Chang, Principal Victor Chuang of the International Department, Principal Shuhuei Chang of the Bilingual Department, and the parents. Although it is only in its third year, the KCISEC Orchestra has participated in several events and held many performances. Students of the KCISEC Orchestra continue to make progress and are able to fulfill the expectations of their instructors. With attentive guidance and the parents’ strong support and recognition, the KCISEC Orchestra’s growth has been outstanding. As an active young conductor, Chih-Chiang Lin is currently the principal conductor of Shanghai Festival Symphony Orchestra and Pastoral Symphony Orchestra. 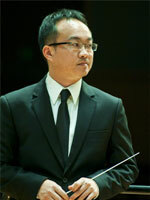 In addition, he serves as the chief conductor of Shanghai Musicians’ Chamber Orchestra since 2012. He is also a regular guest at many concert halls in China and abroad. Recently, he just conducted Mozart Le Nozze di Figaro in Argeles Music Festival in France. And he will conduct Offenbach La Belle Helene in October and Donizetti Don Pasquale in December, 2016. Conductor Lin was born in Taichung, Taiwan and began his study of piano at the age of 5. He got his B.M. degree in Clarinet Performance from National Taiwan Normal University. He won several clarinet and piano competitions in Taiwan, and he played as a clarinet player in some professional orchestras. Conductor Lin got the double master degree in Orchestral Conducting and Clarinet Performance from Indiana University-Bloomington. He studied clarinet with James Campbell and studied conducting with Thomas Baldner, David Effron, and Arthur Fagen. While in US, Conductor Lin served as adjunct lecturer in Indiana University and teaching conducting courses of undergraduate department. At the same time, he was the assistant conductor of New Music Ensemble and conducted many premieres of contemporary music. Mr. Lin also joined many master classes and studied with Leonard Slatkin, Lior Shambadal, Herbert Blomstedt, Jorge Mester, and some world-renowned maestros. In addition to showing as a conductor in many countries, he also devoted himself to advocating the development of ensemble and chamber music. He often talks to audience about the music during the concerts and teaches youth orchestras in schools. He also wrote several articles about orchestra training on magazines, papers, and websites.